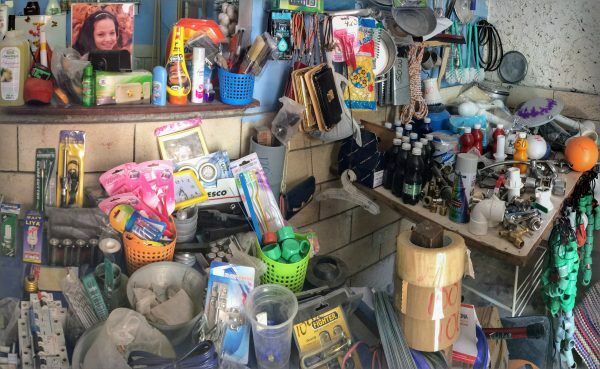 Buying goods in Cuba can be tough, especially if you get outside of the tourist areas. We spent the entire week looking in stores for a knife, for example, to cut our fruit. We never found one. We had to go to 3 different stores with the help of a local to find a packet of coffee. One store had 6 tubes of toothpaste, rice, beans, flour, and 2 bricks of marmalade, in the entire store. Most stores have used items and some are tucked away in people’s homes, so you have to ask around. And packaged goods, when stocked, can be very expensive, ($8-10 USD for a small bottle of shampoo). Dinner can also be difficult to come by outside of tourist areas because locals don’t eat out much, and stores are frequently under stocked or downright barren. Our advice would be to plan ahead, eat when you can, and buy crackers or some portable food to have on you to tide you over. Also, look for cheap and delicious produce sold on the side of the road. This was a pretty well-stocked store, hidden away in someone’s home. 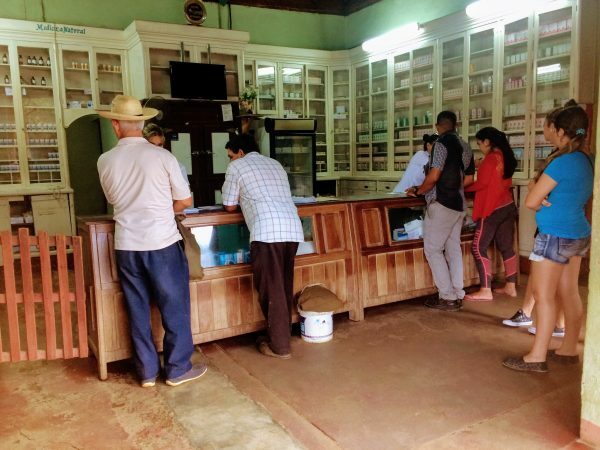 The pharmacy had a few bottles of each medicine and many homeopathic remedies. That quantity may be perfectly appropriate for the small town population. We didn’t see any evidence that there was a scarcity of medical treatment in the country. By all accounts, healthcare is actually quite good! 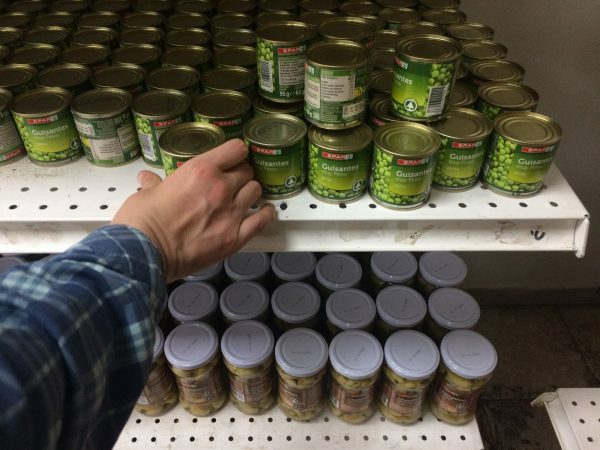 In the best stocked store we saw, were these tiny cans of peas. many shops weren’t so lucky to have canned goods. A young Cuban man waits by the side of the highway, hoping to make a sale. 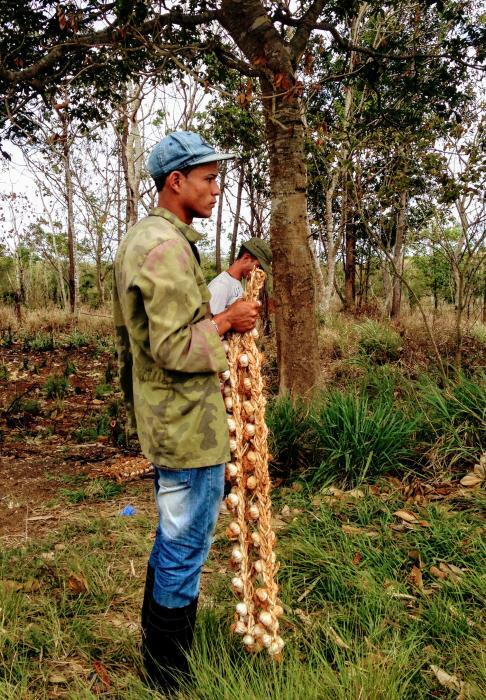 A braid of 12 heads of garlic is sold for 4 pesos (~20 cents USD).